Love playing cowboys and Indians with your kids? Of course, you might have the edge in terms of holding a gun as a cowboy, but the Indian is more that ready to take on any challenge that comes his way, never mind the fact that he knows the land like the back of his hand and is a mean shot with his crossbow. 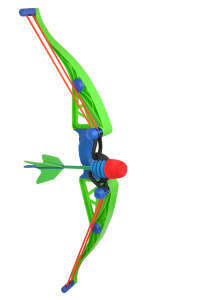 Enter the Zing Zcurve Launcher, a £19.99 purchase that will bring some technology to the world of archery. This is a high performance foam arrow shooter, so you don’t have to worry about putting anyone’s eyes out. Relying on safe, soft, long range arrows that are able to soar up to a range of 100 feet, that also depends on wind direction and how you release the arrow. Each purchase will come with a bow, a couple of long range arrows and a “stick anywhere” Zartz ultra-light foam suction cup tip arrow as well as a “Zip-clip” holder for arrows.